Eungella Mountain Edge Escape – Discover the best of nature's secrets..
Steeped in natural splendour, a misty veil hugs the untouched mountains and peaceful forests of Eungella National Park, Queensland, Australia. Perched on the edge of Clarke Mountain Range, 2,400 feet above sea level and just 80 km West of Mackay, Eungella Mountain Edge Escape offers breathtaking views of the picturesque Pioneer Valley and impressive escarpment! 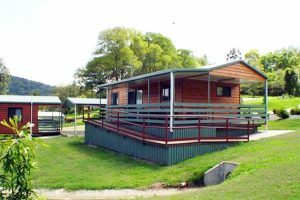 Eungella Mountain Edge Escape provides 1 and 2 bedroom self-contained holiday cabins. Our accommodation is the perfect choice for a family vacation, romantic honeymoon, or simply a relaxing and tranquil getaway. Each cabin features it’s own private balcony with stunning views, kitchenette with cooking facilities, reverse cycle air conditioning and covered parking. Affordable nightly rates starting from just $120.00 (single/couple). Twin share (separate beds) and/or extra guests an additional $ 10.00 per person, per night. 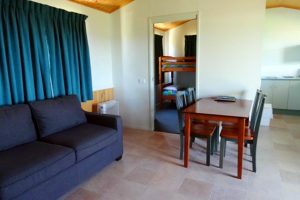 Disabled facilities and wheelchair access only available in 2 bedroom lodge. Don’t forget to check out our annual special offers on website! For reservations please contact our bookings office on Ph (07) 49 584 590. Enquiries welcome via Contact Us form. Relax in the comfort of your cabin, admire the most glorious sunrise from your own private balcony, venture out on scenic self drives, experience a variety of self guided rainforest walking trails, hikes and treks, view Platypus in the wild at Broken River, visit stunning Goodes Lookout, Sky window and Peases lookouts, journey to Eungella Dam and enjoy an abundant variety of flora and fauna. 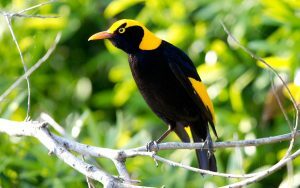 Photographers will appreciate the stunning array of scenic shots on offer, in addition to the impressive diversity of plants and wildlife presented. Finch Hatton Gorge is worth discovering! The Gorge is situated 30km from Eungella (travel by sealed and unsealed road). Stroll through subtropical rainforest trails to reach the gorgeous waterfalls! After a hike, on a hot summers day, take a cool refreshing dip in the striking natural pools of Araluen falls and Wheel of fire falls. For further details check out “things to do and see” on webpage. Eungella National Park is Australia’s largest continuous stretch of sub-tropical rainforest and is one of the most beautiful of Queensland National Parks. Explorers can experience over 20 km of self guided walking trails. A small section of boarded walkways are located at Broken River and suitable for limited mobility. As you stroll along some of the tracks at Broken River and Crediton observe flowing cascades and the river along the way. View drop down menu for further information on walks etc. 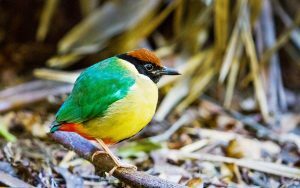 With over 227 recorded bird species, Eungella National Park is the ultimate haven for bird lovers! 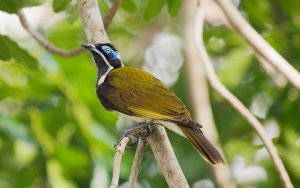 Twitchers and Birders will be captivated by the variety of birds found in the region, including the Regent Bower bird, Noisy Pitta, Wompoo pigeon and of course, the Eungella Honeyeater (endemic to Eungella National Park and can only be found here!). Scroll through our website for information on sightings, or download a bird list. 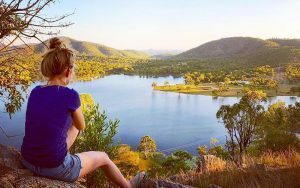 Spend a relaxing day surrounded by cool waters and wildlife at Eungella Dam, or lake. 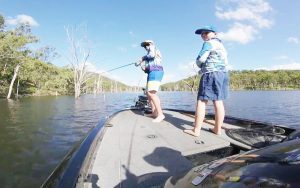 Eungella Dam is one of Queensland’s more established freshwater fisheries, the perfect place to visit for the boating, camping, or fishing enthusiast (fishing permit required prior to arrival). The dam was constructed in 1969, and is located on Eungella Dam road, just 33 km from Eungella township (travel by partially sealed and unsealed road). Fishing permits can be purchased from most boat and tackle stores in Mackay, Melba House (Marian), or click the online link fishing permit. The large fresh water dam is stocked with Barramundi (Barra), Sooty Grunter (Sootys or Black Bream), Saratoga and Sleepy Cod. Lures and bait prawns are best options. 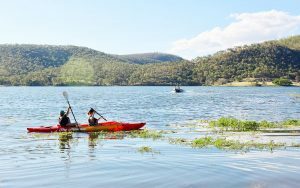 Canoeing, water skiing, jet skiing and swimming are popular activities. No marine craft or fishing tackle hire, so take your own along. Camping facilities include toilets and cold showers. Wood fired barbecues, toilets and picnic tables are located at the picnic area (near Dam wall). Camping is self-registration. For more information on camping at Eungella Dam, contact Sunwater. The Dam is also the customary venue for the World Sooty Grunter fishing Championships, which are held annually. The nearest fuel service station (BP) is located down the valley, just East of Finch Hatton township. 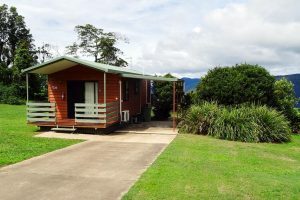 Our cabins are centrally located and just walking distance to the Eungella Chalet (Hotel), Store, rainforest walk entrance, tennis court, restaurant, dining and lookout. Only 5 km to Broken River, Platypus viewing, National Park camping, Information centre and meals. 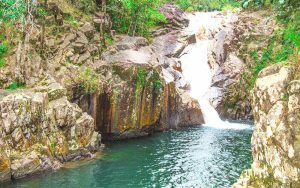 Just 30km to beautiful Finch Hatton Gorge where you can swim, hike and admire stunning waterfalls! Directions: Find us on North Street (first street on right, at top of Eungella range). Located 80 km inland from the Eastern Coast of Mackay, Queensland. Approximately 970 km (603 miles) North of Brisbane, Australia, and only 2.5 hrs to Airlie Beach, Great Barrier Reef and Whitsundays. Tourist information centre’s can assist with holiday advice and additional reservations. 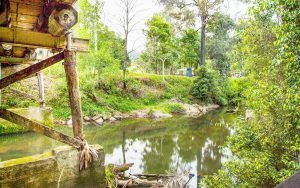 Click on the following links Broken River visitor information centre (Eungella), Melba House visitor information centre- facebook & https://www.queensland.com. Experience the natural attractions and unique wildlife of this beautiful part of the world. We hope to see you soon! Our cabin was well cared for, clean and comfortable. It provided us with spectacular views as it was placed overlooking the Pioneer Valley east toward Mackay. Very easy people to deal with and from previous experiences by the far the place to stay in Eungella. A short hop down the road to Broken River to visit with the platypus and to do rain forest walks. Plenty to see and do in the area and a visit/meal at the local store provides excellent food. I will certainly stay there next time I am in the area as it ‘hands down’ easily surpasses anything else in Eungella or surrounding areas. We stayed in the tulip oak cabin and it was fabulous. The cabin is really well insulated. Cool in summer. Very clean and neat. Great facilities. Outstanding views down the vslkey. A bonus were the fireflies at night. Thank you Debbie you made us feel very welcome. Heartly recommend. We stayed here for 5 nights and thoroughly enjoyed it. The cabins aren’t luxurious but they don’t profess to be. They are clean, comfortable and very well equipped with a/c in both living room and bedroom. There is undercover parking at the front with a lovely deck leading off the bedroom with a BBQ and the most fabulous views down the Pioneer Valley. While the cabins are located in town they are situated on a dead end road so it is very peaceful and quiet. With little or no street lights the sky at night is magic – stars above and the lights of Mackay twinkling off in the distance. There is a general store just down the road but I’d only use it for emergencies – there is a full function Woolies in Marian which is about 20 minute drive down the valley. It is possible to walk to some of the trails in Eungella national park but most you need to drive to. Debbie the manager was fantastic. She was very helpful, friendly, informative and went above and beyond with her service. If everyone was this good at their job the world would be a much better place. The tariff was unbelievably cheap for the facilities and service provided.